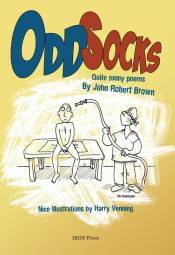 Odd Socks is the first collection of comic verse by John Robert Brown. Enjoy a journey around Brown's special world as he considers the arrival of traffic roundabouts in Japan in 2013, contemplates the uniqueness of Nuneaton and in literate and carefully-crafted verses, muses on the correct spelling and pronunciation of 'aitch'. In these pages we also meet a Blemya, (the mythical man with no head), are invited to consider the atheist views of academic Dr. Richard Dawkins, whose habit is wearing the odd socks of the title. We learn also about the 'pullet surprise' of American jazzman Ornette Coleman, and are introduced to ingenious anagrams devised by another world-famous musician. John Robert Brown also shares the delights of enduring an intrusive medical inspection by way of an endoscope, takes a look in Who's Who , and considers the experience of reading music at Oxford. Odd Socks is a welcome addition to that too small community of intelligent and witty poets. Several of the poems are enhanced by the cartoons of Harry Venning, who created the famous Clare in the Community series in The Guardian and on BBC Radio Four.